Okay, so, filed under "Kagan, Elena; reasons she would be the Supreme Court's greatest monster," I have: secret lesbian, Ivy League, friend of Obama, played softball (cf. secret lesbian), no children (cf. secret lesbian, also see "Cohen, Richard, worst columnist in English language), wrote thesis on socialism in New York, hiring practices, treatment of military recruiters, no paper trail, no judicial experience, reminds everyone of that time President George W. Bush tried to nominate Harriet Miers on some sort of dare, and secret lesbian. Am I leaving anything out? Oh, hey, MSNBC contributor Pat Buchanan! You wanted to add something? Oh, well, there you go. Pat Buchanan has counted up the Jews on the Supreme Court (no doubt with the help of current Bob McDonnell crony/former Nixon White House "Jew-counter" Fred Malek) and has discovered that there is just not enough Protestantism on the Supreme Court, thus continuing America's rich tradition of only letting Protestants do just about everything else in American society. Remember the last time we had a fresh-faced Supreme Court nominee to obsess over? Back then, Pat Buchanan was all worked up about Sonia Sotomayor successfully learning English and going to Princeton, and how awful she was for doing so -- or something! It did not make sense. 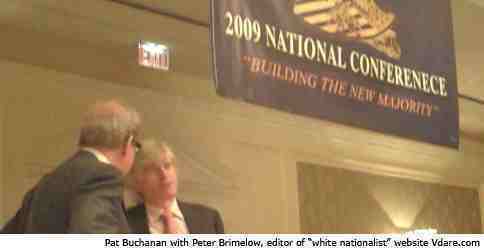 Later, Buchanan got together with a bunch of fellow travelers and talked about Sotomayor's Hispanicity at some sort of conference. Oh, wait! I'm sorry. At a "CONFERENECE". Anyway, this is a crushing blow to the American Jesus. The end. Overall, Jews represent 6.4% of ALL SCOTUS justices over the years (7 Jews have sat on the bench, total). By contrast, over 32% of justices have been Episcopalians, when only 1.7% of the country is within that religion. of Justices by their faith.